Nanorobots search for organ-inlets demanding protein injection. Image credit: Adriano Cavalcanti, et al. But there is still a great deal of work to do before tiny “molecular machines” can begin traveling through our arteries for diagnosing or treating our ailments. To try to pick up the pace, a group of researchers has recently developed an innovative approach to help in the research and development of nanorobots – virtual reality. 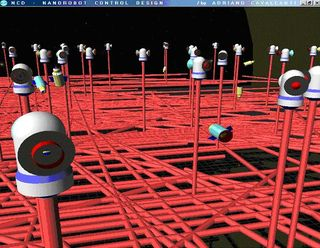 In a demonstration of the real-time simulation, the nanorobots had the task of searching for proteins in a dynamic virtual environment, and identifying and bringing those proteins to a specific “organ-inlet” for drug delivery. The researchers analyzed how the nanorobots used different strategies to achieve this goal. For instance, the nanorobots could employ different sensory capabilities such as chemical and temperature sensors, as well as random movement. For the nanorobots, one of the most difficult parts was maneuvering close enough to a biomolecule to be able to sense that biomolecule, while accounting for many different forces and moving bodies. Unlike on the macroscale, viscosity dominates movement in arteries, affecting the nanorobots’ traveling as it encounters obstacles and proteins moving passively through the fluid. To demonstrate the system, the researchers tested several cases where the nanorobots used different strategies to detect proteins, and in vessels with varying diameters. As expected, their results showed that nanorobots have a better chance of finding a target in smaller vessels. Also, the use of both chemical and thermal biosensors greatly improved the nanorobots’ efficiency compared with random motion. In addition to sensing, the simulation will hopefully provide interactive tools for many challenging aspects of nanorobot design, such as control methods, manufacturing approaches, actuator (motor) design, and more. The researchers are currently using the simulation for tests in laparoscopic surgery, diabetes, cancer, brain aneurysms, cardiology, military biohazard defense, and drug delivery. The development is highly collaborative, with advances depending on future improvements in nanoelectronics, new materials, and genomics research. With all these disciplines moving ahead, a precise simulation system can help researchers understand the performance requirements for practical nanorobots, even before the technologies exist. He explained that the biggest motivator for innovation comes from economic and strategic interests. Due to the wide variety of applications, nanorobots will almost certainly offer economic incentives. Due to these motivations, Cavalcanti hopes that working nanorobots will be here in the not-too-distant future. “If you consider the velocity that miniaturization is moving, from micro to nanoelectronics, then you can easily understand the feasibility to have medical nanorobots integrated as a nanoelectronic molecular machine before 2015,” he predicted, adding that nanorobots, like all medical technologies, would still need to undergo safety testing, which would push back the date for mass production and commercialization. Publication: Cavalcanti, Adriano, Shirinzadeh, Bijan, Freitas, Robert A Jr., and Hogg, Tad. “Nanorobot architecture for medical target identification.” Nanotechnology 19 (2008) 015103 (15pp).